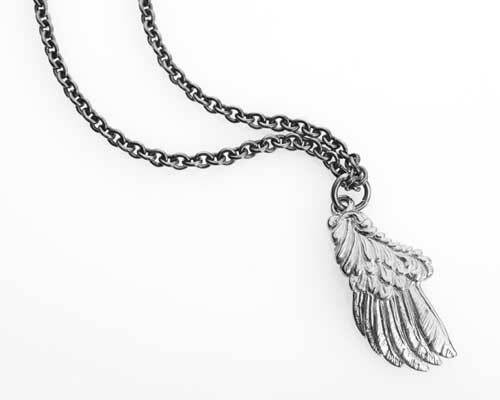 Free Bird Silver Necklace : LOVE2HAVE in the UK! "Cause I'm as free as a bird now, and this bird you'll never change." as the classic song by Lynyrd Skynyrd goes. Well, this handmade silver necklace for men and women is part of our range of jewellery inspired by the natural world. The pendant, in this case, comes in the form of an intricately detailed birds wing. The detail is outstanding featuring feathered detailing that more than conveys the highly skilled artistry that went into creating it. The design comes on an 18-inch silver chain so is nice and secure and is joined to the chain by an eyelet which is yet more attention to the quality design and craftsmanship on behalf of the designer.